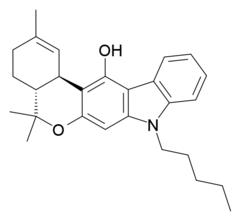 JWH-161 is a cannabinoid derivative that was designed by Dr John W. Huffman's team as a hybrid between the dibenzopyran "classical" cannabinoid drugs and the novel indole derivatives, in an attempt to unravel the differences in their binding modes to the CB1 receptor. While retaining structural elements from both families, JWH-161 has a CB1 Ki of 19.0nM, although it was found to be slightly weaker than THC in animal tests. ↑ Huffman JW, Padgett LW (2005). "Recent developments in the medicinal chemistry of cannabimimetic indoles, pyrroles and indenes". Current Medicinal Chemistry. 12 (12): 1395–411. doi:10.2174/0929867054020864. PMID 15974991.